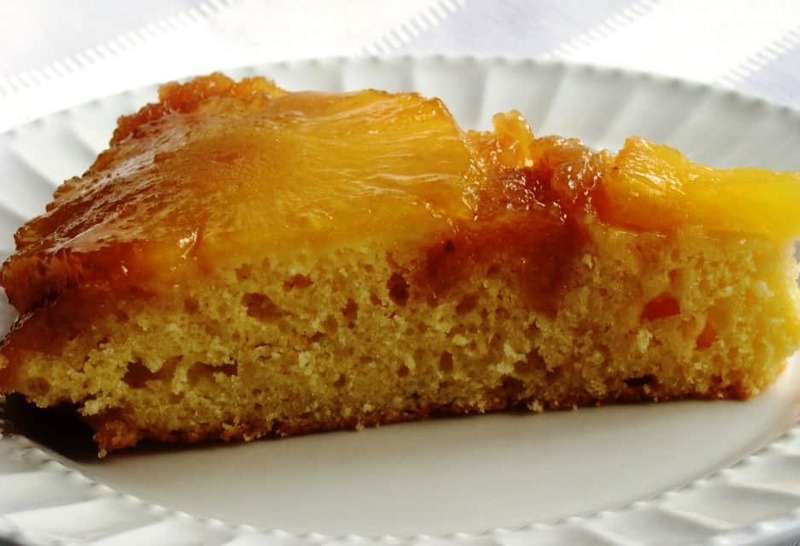 Pineapple Upside Down Cake – The best, most tender and delicious Pineapple Upside Down Cake! Pineapple Upside Down Cake is a classic American Cake made with a moist cake batter and a flavorful buttery topping of pineapple rings. Spring, is that you out there?!? Holy sun, I missed you! This morning I woke up at my usual 6-ish, had a cup of coffee, a bowl of cereal, and I took off. I was standing in front of the grocery store waiting for them to open at 7 am. I was there to pick up whatever I could find that would remind my kitchen of warmer days. I saw some apples and pears. I also tasted the berries… um, no taste! I kept moving along the produce aisle and I laid my eyes on some pineapples. They looked really good – perfect golden color, they were firm, and they had a yummy sweet smell. I put one in my basket, paid for it, and came home. What are the ingredients for pineapple upside down cake? 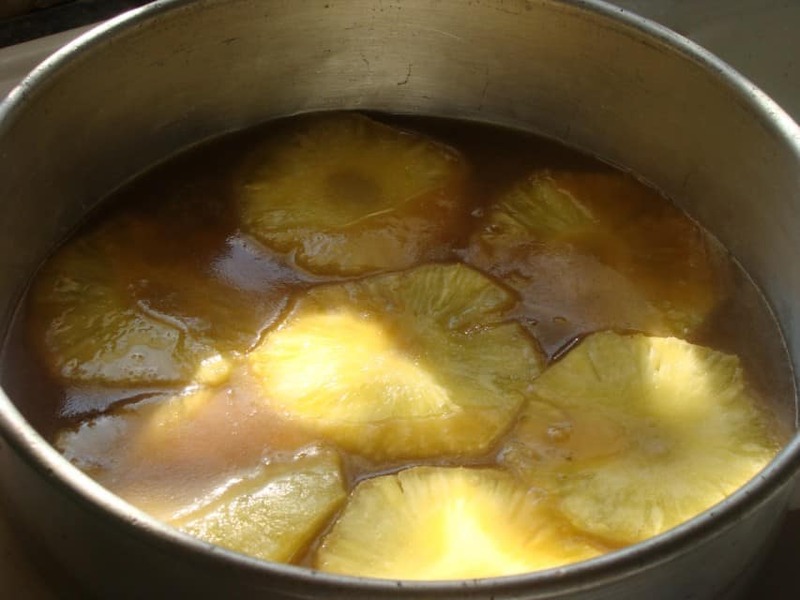 Mix melted butter with the brown sugar and pineapple juice. Pour the brown sugar mixture in the bottom of a cake pan. Arrange pineapple rings on top and set aside. Stir together flour, salt, granulated sugar, and baking powder. Beat egg yolks until lemony yellow. Stir in pineapple juice, vanilla, and melted butter. Add this mixture to the flour mixture. Pour prepared batter over pineapple rings in the cake pan. And once Ana went to take her nap, Mama made herself a fresh pot of coffee to enjoy with a piece of this amazing pineapple upside down cake! I just wish it was Sunday, my “Eat Whatever The Heck You Want Day”, so I could have a few more slices. Melt the butter, but keep the sticks separated. That is, melt 1 whole stick in one bowl, and the other half of a stick in another bowl. Brush a little bit of the butter on the inside of a 9 inch cake pan. Mix half of a stick of butter (4 tablespoons), melted, with the brown sugar and add in 1/4 cup of the pineapple juice. Pour the brown sugar mixture in the bottom of the cake pan. Arrange the pineapple rings on top of the brown sugar mixture. Set pan aside. Stir together the flour, salt, white sugar, and baking powder. Beat the yolks until lemony yellow. Stir in the remaining pineapple juice, vanilla, and remaining melted butter. Pour batter over the top of the brown sugar and pineapple rings. Remove it by covering up the pan tightly with a serving dish and invert so that the pineapple side is up. I made it, who else? I tasted it, my family… I’ve made it for friends, company, etc… It’s a delicious cake. I feel exactly the same about fruits this time of year! Apples and pears are fall/winter fruits, and it’s pointless to buy berries and cherries, even with the sale signs. They’re just not in season. Pineapple upside-down cake is good any time of year, though. Looks delicious! Beautiful pic. Looks moist, sweet, and delicious. One of my favorite desserts and anything with pineapple! So sorry to hear you can’t get your hands on any good berries, I have been on a lucky streak I guess…blueberries are huge and sweet! Okay also I want to let you know that I have been tagged in a game “Tag you are it”! and I am tagging you now! :) Visit when you have time! I hope that your weather is still behaving! It was all of 72 degrees here today. Beautiful. Your cake looks like sunshine. It made me want one so bad I will head to the store tomorrow just to buy a pineapple to make it. I love this cake and haven’t made it in years. Thank you for the reminder and the recipe. here it’s getting warmer and warmer lately too. I’m so longing for sunny days, probably most of us do. your cake make me dream of tropical beaches and tons of relaxing moments. Horay for spring!! As I type this it is snowing again here….crud! Gorgeous looking cake Kate! This looks way better than the ones we used to try to bake at camp in a reflector oven. You are so smart to bring spring into the kitchen….I am so ready for the warm weather! When I was younger I asked for Pineapple Cake every year for my birthday and my mom lovingly made it for me. I have never made one for my kids though! I actually have a full, ripe pineapple on my counter, I might just give this a go tomorrow. My son loves pineapple like I do, I bet he will be happy. Now if only I could get pictures as nice as yours I’d be set!! I love pineapple upside down cake! I don’t remember the last time I ate some and you just made me crave it ;). I’m glad the weather is all sunny and balmy, here in LA this week the weather decided to be not as peppy. But really I can’t complain…we had the best winter ever…. compared with what east coast had to endure. Your cake looks divine, I love pineapple in any way possible, it’s Just delicious. We had five days of spring-like weather and winter returned today. It has been winter in myome until I opened your blog and sawyour perfect, spring cake! My mood instantly lifted. This looks so pretty! Pineapple upside down cake always reminds me of spring – right around the corner! Your cake is so pretty Kate! I love upside down cakes. I have to try your recipe:)Thank you for sharing. Hope you have a nice weekend!! I am ready for Spring and a slice of this cake. It looks wonderful! This looks amazing! I’m craving this now.. and summer weather! I haven’t had this in forever. It is the perfect cake to eat with a deep, robust cup of coffee. For you, Kate, an award! I have so enjoyed visiting your site. Your posts are always bright and beautifully photographed. Your site is clean and crisp and your banner is cleverly stylish … hence a Stylish Blogger Award! If you’d like to play along, check out the link below for the award badge and particulars! keep up all your hard work! This looks very yummy! I would love to make it. Thanks for sharing the recipe. Trying not to get too excited about this lovely weather here in Michigan. Mother Nature is just baiting us in for the next round of winter weather. I am however baited in by your beautiful pictures. Thank you for that round of sunshine and great recipe. This cake looks amazing! 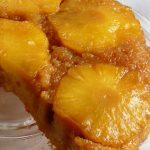 I’ve actually never made pineapple upside down cake, but definitely love your recipe and will have to try! I haven’t made pineapple upside down cake in many years, but it’s time to make one now. Yours looks so yummy, bursting with flavor and thoughts of Spring. Here in Chicago it was 50 degrees today with no sun. Made with fresh pineapple, this cake sounds amazing. I think spring is trying to take hold around here too and I’m so excited! Let’s hope it sticks around! I love pineapple upside down cake too! It is finally warmer here in Austin. I’m savoring the sunshinet! Thank you so much for sharing…and thank you for visiting my blog! Yum!! 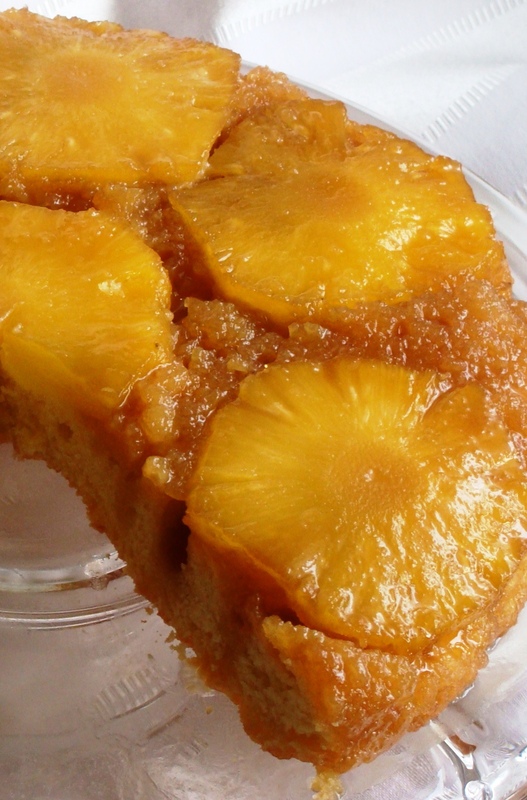 I love pineapple upside down cake, especially when it’s made with fresh pineapple! Looks amazing! Nice work on getting going this morning! You’re certainly right about the weather…after a winter ranging in temp from -20 to 30 degree F weather, I’m really enjoying the 55 degrees it is right now!! I’ve been meaning to try mini pineapple upside cake using muffin tins, so I think I’ll have to use your recipe for that. Your cake looks delicious! I am such a sucker for pineapple upside down cake! Thanks for planting the seed! Your cake looks scrumptious! This is one of my all time favourites! Rich, aromatic and moist…perfect to go with some black coffee! mmmm looks really good. Gives me a good idea for a post for a GF pineapple upside down cake I’ll have to try tonight. I’ll let you know how it goes. what a beautiful tribute to the spring to come….sigh…and it can’t come soon enough for me! I love pineapple upside down cake in all its buttery sweet glory, if my wife see this post, I will be making one this weekend! This brings back memories! I remember my mother making and upside down cake when I was little and being totally confused by the concept. I couldn’t understand WHY anyone would want to make a cake upside down… and how could you eat it? Needless to say, with one bite my questions dissolved along with the cake in my mouth and I have been a huge fan ever since. Great recipe! Thanks for the memories! And yes, it’s so summery, so full of joy. Gorgeous! Love Pineapple Upside Down Cake! Thanks for bringing your ray of sunshine over here. What an early bird you are! That carmelised pineapple is just calling on us, EAT ME. Love the change to the classic apple. Cheers to sunny days! Yay, yay, yay–it’s beautiful here too! I definitely think we should ALL celebrate with upside-down cake! My mother used to make a fantastic pineapple upside down cake (with a maraschino cherry in the middle of each pineapple ring) and this has me feeling super nostalgic! This cake looks really great and full of sunshine. Kate, that is one of our all times favourite cakes at home and yours looks absolutely perfect!!! You will now make my son forcing me do one for him when I get back home from work :)) your photos are so stunning!! Love the color on that beautiful piece of cake..yummy!